Is your writing masculine or feminine? Want to find out if your writing style has a distinct feminine touch? Or does it reek of male chauvinism? Well then, check out Gender Genie, a website designed to predict whether a piece of writing is likely to have been written by a male or a female author. 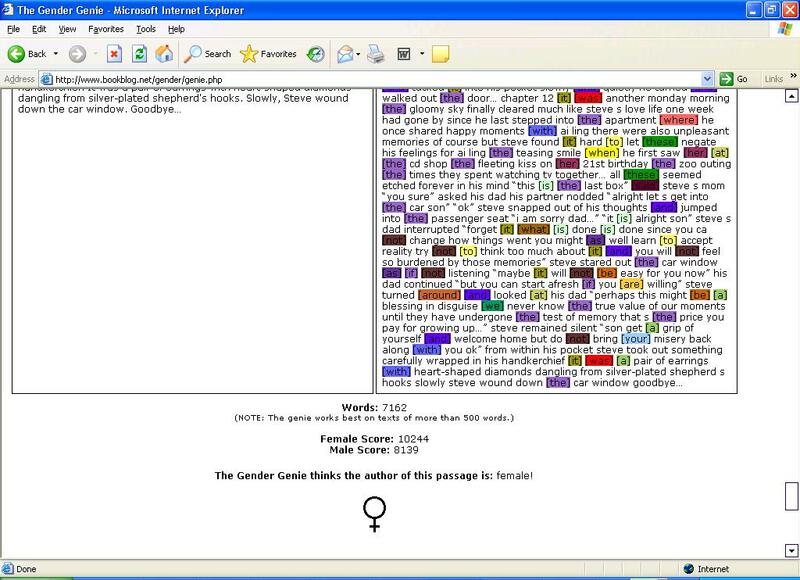 The tool is based on a simplified version of an algorithm that looks at the significant difference in the way different sexes use pronouns and certain types of noun modifiers. I did some random tests and most of them were pretty spot on. But then an idea struck me and I put a ficton story I wrote (“Heart Of Glass“) to the test. True enough, Gender Genie determined that the story was written by a female author. See if you can also fool Gender Genie into becoming a Gender Bender. Btw, the research paper can be downloaded here. Face dance. Okay, Facebook, sue me!